Large capacity storage for all your garden tools etc. with useful adjustable shelves to one side. Also supplied are additional door trays to clip in- on to the back of the doors. 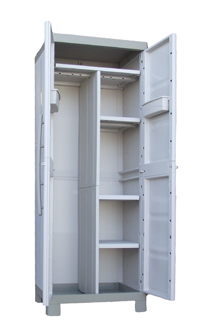 Pad-lockable doors, weather resistant, maintenance free.U.V. stabilised, plastic easy clip together assembly in minutes.